It was a crisp mid-August morning yesterday and we went for a long hike, which started at 7:04 AM. We have been trying to collect as many stamps as possible for the Oak Leaf Trail Milwaukee Parks Passport (2014), so we decided to walk part of the Menomonee River trail, starting by Silver Spring and 107th St. With the temperature in the lower 60s, the sky displayed a perfect late summer blue while the foliage was entrenched in a deep dark green. 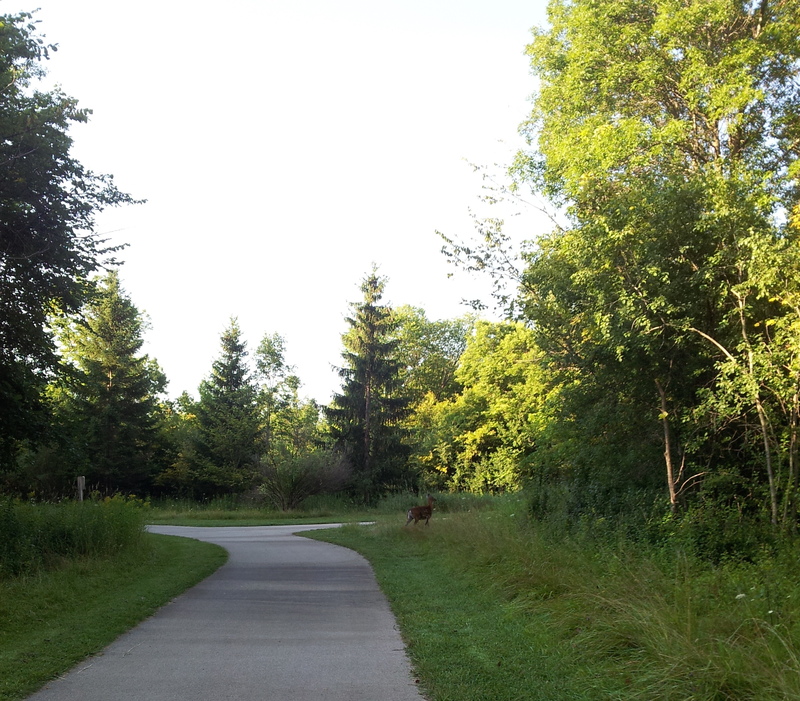 A little over a mile into our walk, there it was over on our left: a deer. We stopped to take photos, watching the graceful animal cross the path and gaze upon us again from a safe distance. -They don’t attack people, right? -I asked Kevin while suspecting my question would not do justice to the gentleness of the spotted creature. Why would anyone shoot such a gentle animal? I felt compelled to ask in all honesty, because it seems vicious to do so (even if people have a right to do it, which oddly, I’m not arguing against). As I posited the question out loud, it could not help to think about all the atrocious news–throughout history too–but mainly this summer from all over the world. The show and abuse of force displayed upon the seemingly weak, the “easy targets,” the so-called wimpy ones: isn’t that a reflection of something profoundly wounded in the perpetrators of violence? Were they–at some point also–kind, gentle, or even “easy targets” and because of the experience of overpowering forces, repression and/or machismo ended up giving in by shoving away an innate grace? The image of deer from yesterday morning–the nice surprise of the emerging day–stayed with me all day long and into today. 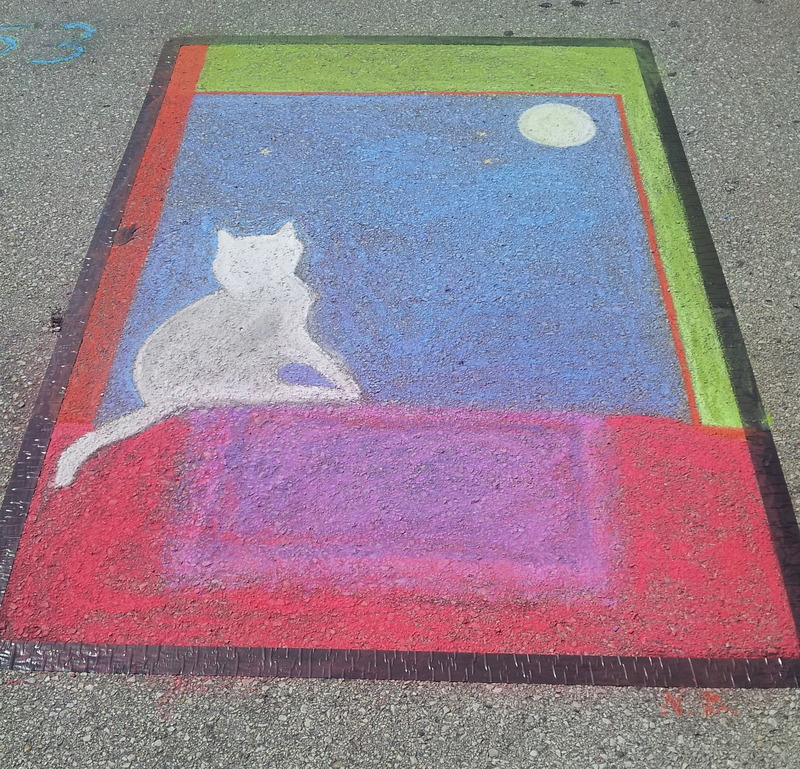 This morning, we participated again in the Chalk Art Festival at Bayshore. This year, Kevin painted a galaxy, while I painted a cat looking out the window. This feline is looking outwards and upwards to the bright moon. This feline is a silhouette that attempts to convey mystery and wonder as well as the awe-inspiring magic that surrounds us. When we let our gentle and true spirit roam free, we are more attuned to enjoy the magic of the sky, the world, the universe, i.e. all that is. By Monday morning, the chalk art pieces will be gone. Contours traced by chalk will remain slightly visible for a few days, maybe weeks. But there will always be a cat looking out the window somewhere in any town in the world, staring into the unknown. And there is always a chance to cross paths with a graceful creature or soul when we explore new trails.